From a Netflix and chill-themed Airbnb pad to a Lana Del Rey song-title generator, Art404 puts out projects that are topical, powerful, and often hilarious. The New York-based startup (“artup”?) consists of four full-time members and a few outside collaborators who code, design, perform, and draw across various media. Micah Milner is the group’s graphic designer, responsible for the stunning @micahnotfound Instagram account. 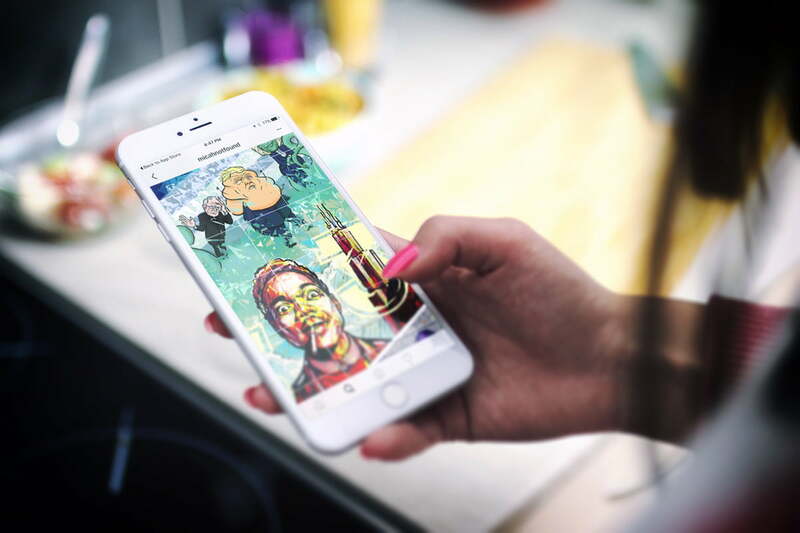 Digital Trends recently spoke with him to get a feel for what it means to make art in a social-first economy, and how the group makes a lasting impact by riffing on the inherently temporary themes of pop culture. “We happen to be drawn to that subject matter,” Milner said over the phone. “With pop culture, it’s important to utilize the right medium. You have to work at a fast pace and release it in a way that can reach a lot of people in a short time.” For Art404, that means working directly through social media, or in such a way as to generate interest on social media (such as the group’s “Macbook Selfie Stick” performance piece). In one sense, Milner’s Instagram account is a more traditional type of art compared to the group’s other projects. It serves as a visual chronicle of current events, each individual image living as a “tile” within the full work, which comes together only when viewing the main profile page. This in itself isn’t a new idea — many Instagram accounts follow a similar pattern — but Milner’s is different: the entire account is one single work of art, a living mural that continually changes. As tiles are added, the piece grows, the new seamlessly blending with the old, Kylo Ren transitioning effortlessly into Ziggy Stardust. It’s a perfect example of using a digital medium, specifically a social one, in a way that would not be possible in the physical world. It offers the immediacy required for covering current events, but in a way that also gives it permanence and long-term significance. “It provides a history of moments, knitted together in a continual timeline,” Milner explained. Milner added 70 or so tiles when the account went live, and from there began uploading just a single image every day. With each new upload, the grid shifts — older images are pushed right, or drop down to a lower row. Making sure the grid continued to line up with new content was no easy task. Milner designs 12 to 15 tiles simultaneously, using a combination of Adobe Photoshop and Illustrator. He pulls source material into Photoshop to create the composition and uses Smart Objects to preview how it will look as the tiles shift on Instagram. Then he creates line art in Illustrator, brings the assets back into Photoshop for coloring, and then it’s back to Illustrator for the Live Tracing tool to change the bitmaps into vector data that can easily scale. If this sounds like a lot of work, that’s because it is. When the account was in its heyday, Milner said he spent around 30 hours a week, usually over three 10-hour days, creating artwork. Working that quickly was imperative to the project’s success as a document of current events. “If I just waited one or two days, it already felt stale,” he said. Producing content for social media has its own set of risks and challenges for artists, but Milner was quick to put this in perspective: “It’s a social-first climate in anything: art, marketing, business. Anything.” Not every artist, nor every type of business, has adapted easily to social media, but it’s a tool that happens to be well-suited for the projects that exist in Art404’s wheelhouse, which deal with advertising, pop culture, and tech. On the impact social media has had in the art world, Milner was mostly positive, but noted that it’s certainly not any easier to make a living as an artist. “The biggest advantage is for the viewer,” he said, adding this also benefits creatives, as they “have more access to high level artwork than ever before.” Inspiration is everywhere, and it’s immediately accessible. He acknowledged that the topic deserves a larger conversation, especially when it’s a corporation, rather than an individual, accused of stealing artists’ work. Ultimately, though, “I can’t get too upset about it,” he said. Monetization is another challenge and, again, this isn’t anything new for artists. The most popular Instagram accounts are able to monetize through product placement, but an account can’t generate much income “unless you’re getting six or seven-figure follower counts,” Milner said. For @micahnotfound, it wasn’t even an option — any post that upset the grid alignment would ruin the function and aesthetic of the piece. Plus, the account’s 32,000 followers simply weren’t enough to make it work. Instead, like many of Art404’s projects, @micahnotfound serves the group’s financial needs in an indirect way. Its members put out a lot of work for free and for fun, which has paid off with exposure in major media and by attracting paying clients who like the group’s style. To learn more about Art404 and its other projects, head over to the group’s website.